H. White Christmas has been showing off her dainty white petals for us! She is the perfect flower to go between the other colorful Hippeastrums but as you can see she is amazing all alone! A very nice looking white bloom....I just may have a few more of these bloom this year! Hi mama I love the pics!!! Lovely pics. 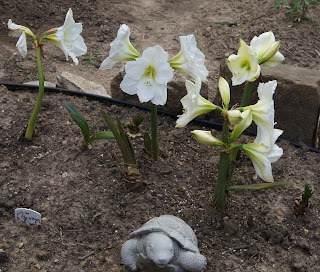 I am looking at all things Hippeastrum on the web. Thank you, Hazel, can't wait until they all bloom again!